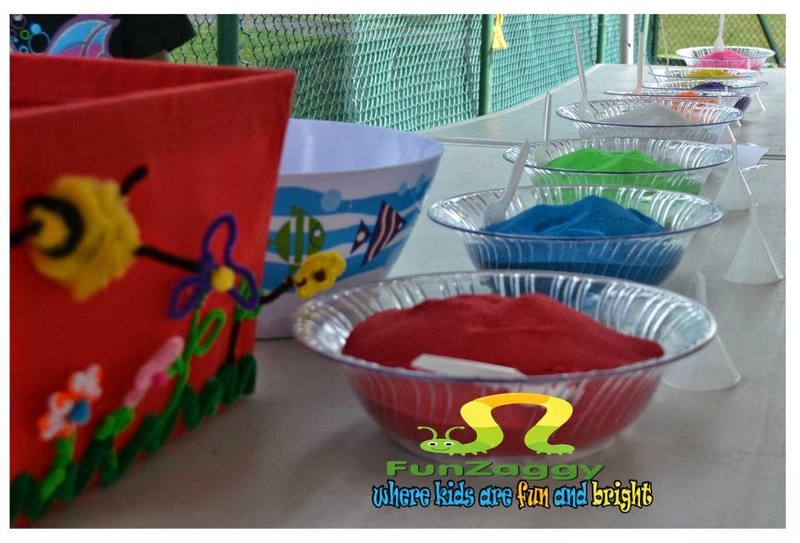 Have your kids done Sand Art with FunZaggy? 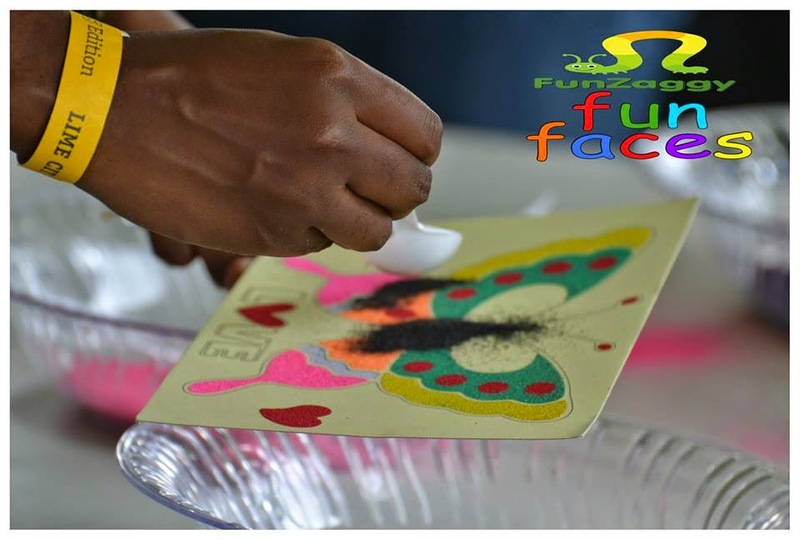 FunZaggy is happy to have introduced Sand Art to many children here in Dominica. It certainly has been a great addition to our fun packages. Many of the children had no idea what it was at first however the amazingly bright variety of coloured sand was enough to quicken their pace to surround this tabletop activity, ready to have fun with it. Indeed, Sand Art has been a hit from day one and the momentum continues as there's always a new design, a new sand colour, new stages of development or a new friend to introduce to this fun activity. Okay, just in case you have no idea what I'm talking about, Sand Art is an absolutely positive, simple, beautiful and delightful activity where children create artwork by making use of brightly coloured sand. It is enjoyed by both boys and girls including tweens and teens. Sometimes, even parents and caretakers join the fun. 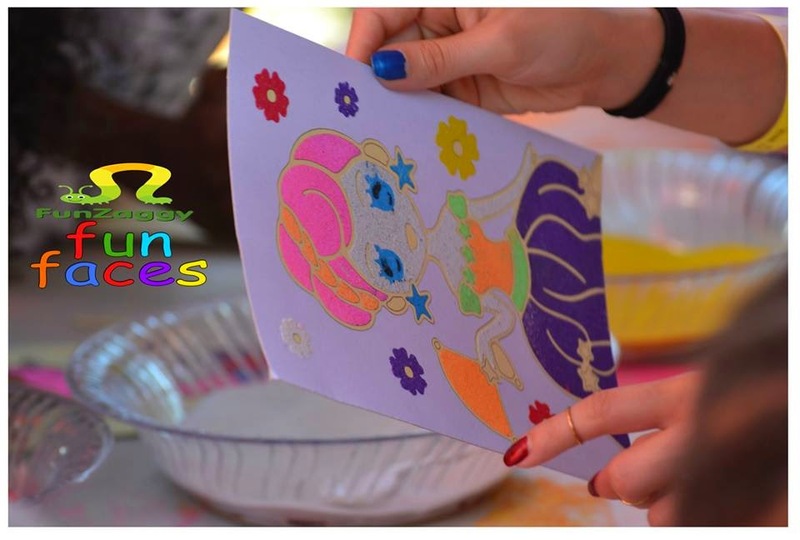 At Funzaggy, we provide two variants of this activity. Here's a brief description of each. Sand Bottles: Participants are provided with small, clear, fun-shaped plastic bottles. Each participant picks a bottle of his/her choice. Bowls are lined up on the table sporting a bright shade of sand in each. Using a funnel, spoonfuls of each, or selected colours of sand are placed in layers in the bottle, forming a rainbow looking design. This is continued until the bottle is full to the brim. It is then fitted with a bottle stopper. Participants happily view each other's designs and take home their prized possessions. Sand Cards: Participants are provided with pre-designed cards and picks. The picks are used to gradually peel off the top layer of the design below which, adhesive is found. The participant then approaches the bowl which contains the colored sand of his/her choice. He/she adds the chosen color to the peeled off section. The sand adheres to the surface and that section has been colored. the process is repeated until the design is complete. A plastic sleeve is provided to store and protect the design. Development of Fine Motor Skills: This activity involves using small picks for peeling layers, lifting of edges and distribution of sand - a process which facilitates coordination of fingers, hands and eyes. 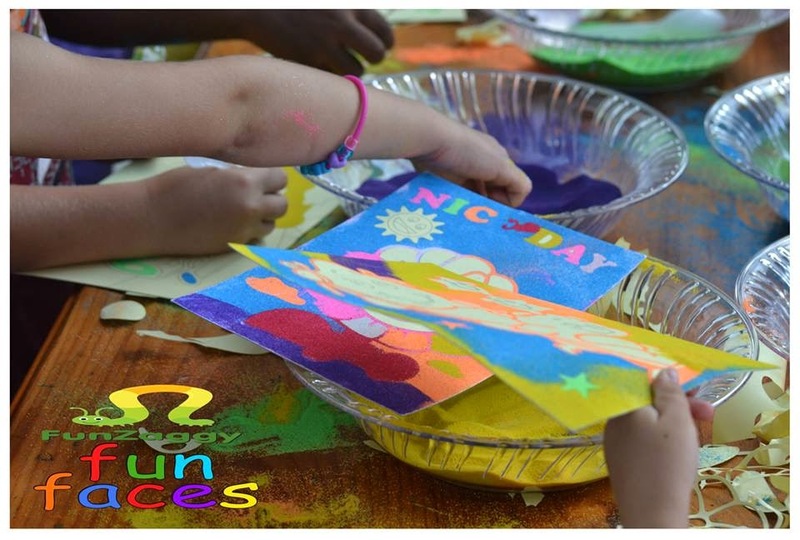 Creativity: This activity affords the child the use of imagination. Instead of the traditional yellow sun, we have seen many pink suns and candy swirl colored oceans. hmm, this may just be the birth of something big. Confidence Building: Children enjoy managing their own affairs while doing this activity. This fosters independence. 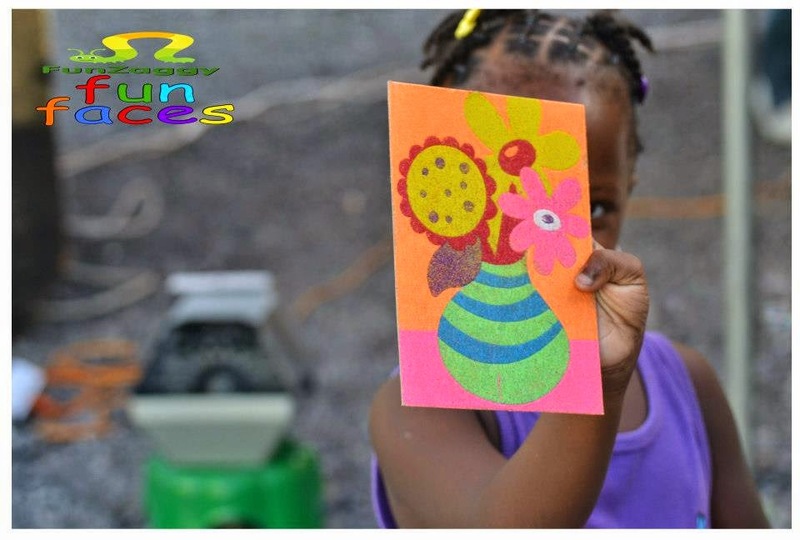 They also feel a sense of accomplishment after having picked their own colours and created their own masterpieces. Socialization: As children work around the table, they converse while asking for help, giving compliments, asking for advice etc. They even compare and contrast designs during and after the activity. Sand Art is a great activity to do just about anywhere where there's a group of children. Some of the best places are at Holiday Parties, Birthday Parties, Fairs, School and Church activities, Festivals among others. 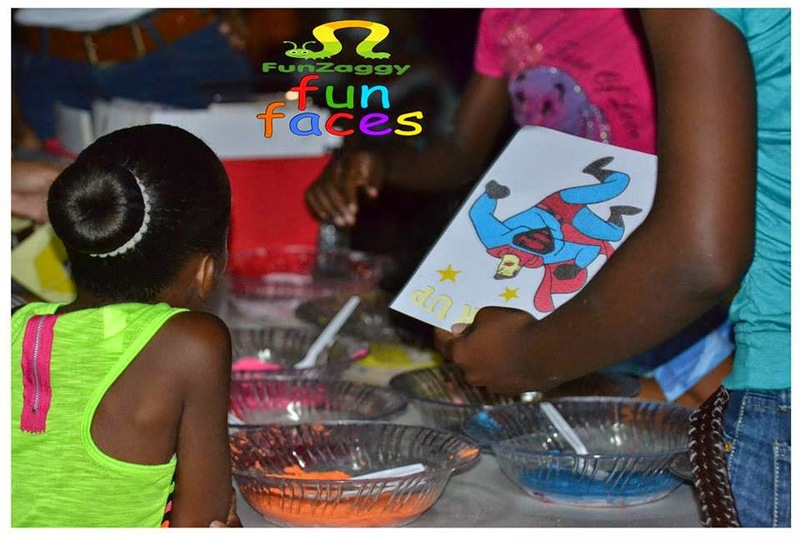 FunZaggy has presented Sand Art Stations at most of the major events on island. We have also set up at various birthday parties. It sure has been a BLAST. The children really enjoy this activity.